The dude on the right is Mawdryn, played by David Collings, a character actor that everybody loves and who we saw a few months ago in “The Robots of Death”. He and his seven fellow mutants are not wearing the most fashionable in outer space wear. Marie called their clothes “terrible bridesmaid dresses.” Even when you’re missing a chunk of your scalp, it’s hard to look menacing dressed like that. 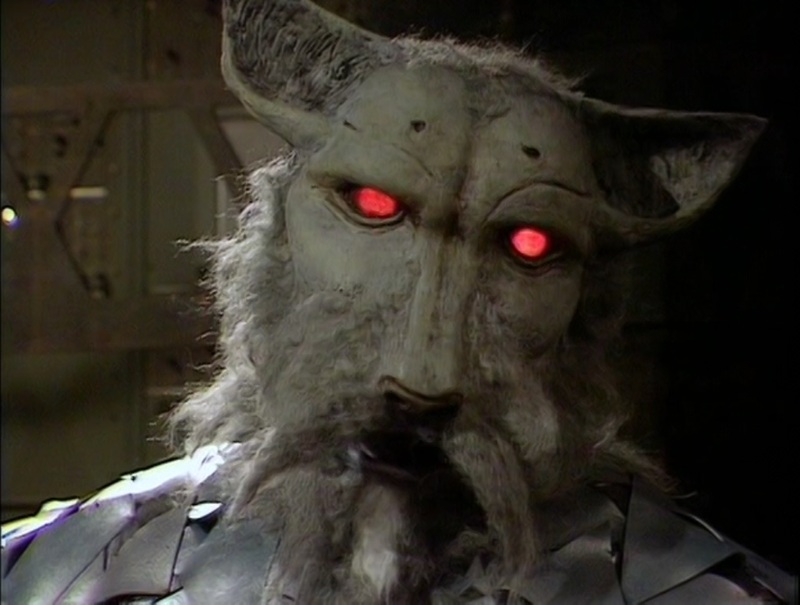 But Mawdryn isn’t a traditional villain. He and his gang stole some Time Lord tech several centuries ago and have been trapped in perpetual, mutating rejuvenation ever since. All they want now is to die, and by chance, the Doctor has shown up. Apparently he can exchange the potential energy from each of his remaining eight regenerations to kill all eight of the gang, but he’ll never be able to regenerate again himself. As motivations go, I think that’s incredibly original. It’s also a little convenient, what with the numbers working together like they do, but that’s fiction for you. I’m glad to say our son came around in the end. As I remembered, there’s a good bit of padding in part four, reminding everybody of the plot, emphasizing all the relevant points again and again, but there are enough moral dilemmas and runarounds to keep things moving, and our son was very happy with the adventure. It even ends with an explosion! It may not be a great story, but it made a splendid recovery from that lousy opening installment. “Mawdryn Undead” is a four-part serial written with passion and enthusiasm by Peter Grimwade, directed with either disinterest or contempt for the material by Peter Moffatt, and featuring music by Paddy Kingsland that sounds like a joke B-side from one of Erasure’s earliest singles. As I’ve mentioned before, many Doctor Who adventures from the serial days will start strong before petering out. 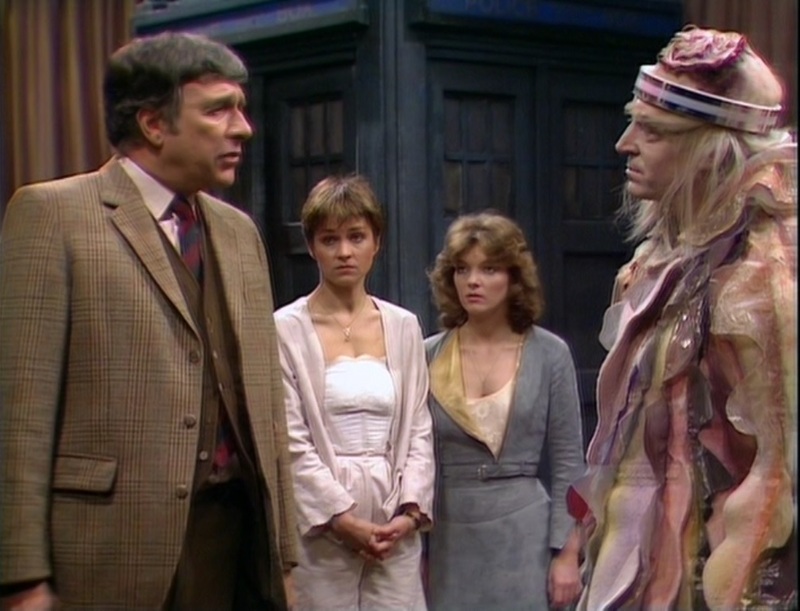 “Mawdryn Undead” is possibly unique in that it becomes a good, interesting story with a great idea at its core, but it begins with what is very nearly the worst first episode in the whole of the program. 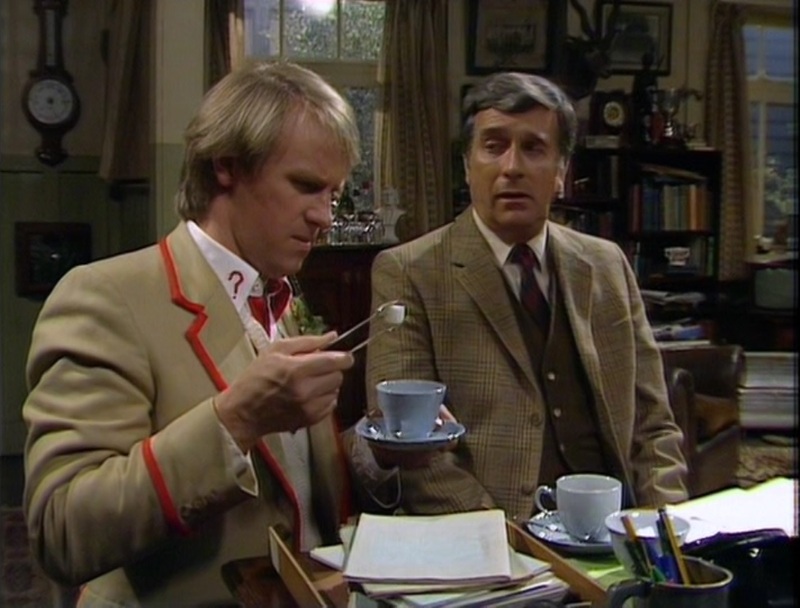 The first episode of “The Twin Dilemma” is even worse, but that serial never gets any better as it goes along, so the mind-crushing awfulness of the first part of “Mawdryn” is an amazing standout. And, in fairness, I should concede that Kingsland’s music also gets a little better as the story continues, but the dumb, jaunty “joyride” music that accompanies the young men pretending to be teenagers in their straw boater hats as they steal the car will be stuck in my head on my dying day. 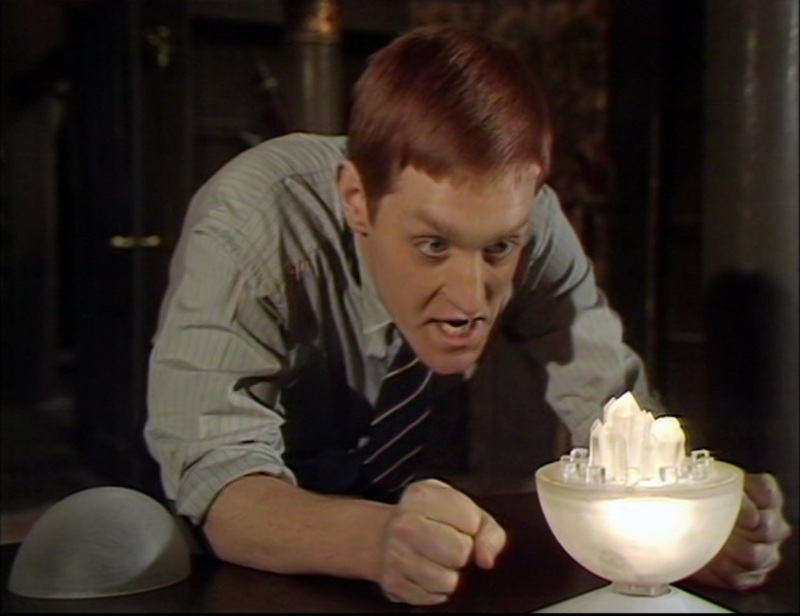 I’ll talk more about Turlough, one of the biggest missed opportunities in the whole series, another time. Suffice it to say for now that in 1982-83, Doctor Who was in such a dumb headspace that they honestly thought that making the school bully into a companion was a good idea. Even the effects defy suspending disbelief. Most of the time, when Doctor Who gives us a show-stopping terrible special effect, it has the decency to wait until the end of the serial, and it almost always looks like the work of very talented people who did their very best with the time and money available and just couldn’t quite bring it off. 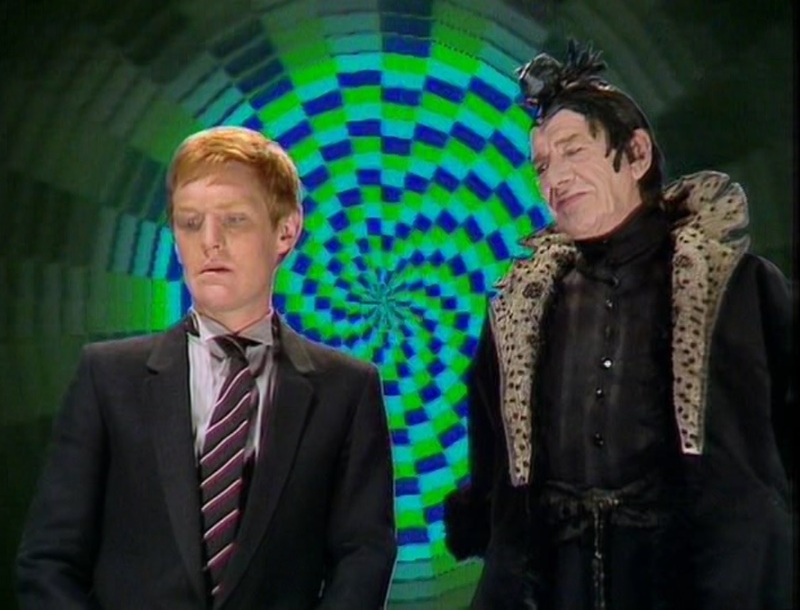 Four minutes into “Mawdryn” and Turlough is supposed to be having an out-of-body experience on the astral plane, and all that the visual effects team bothered to do was switch on the background animation from a game show hosted by Wink Martindale. But here’s what really gets my goat. Here’s your big guest star this week: some guy. Come off it. 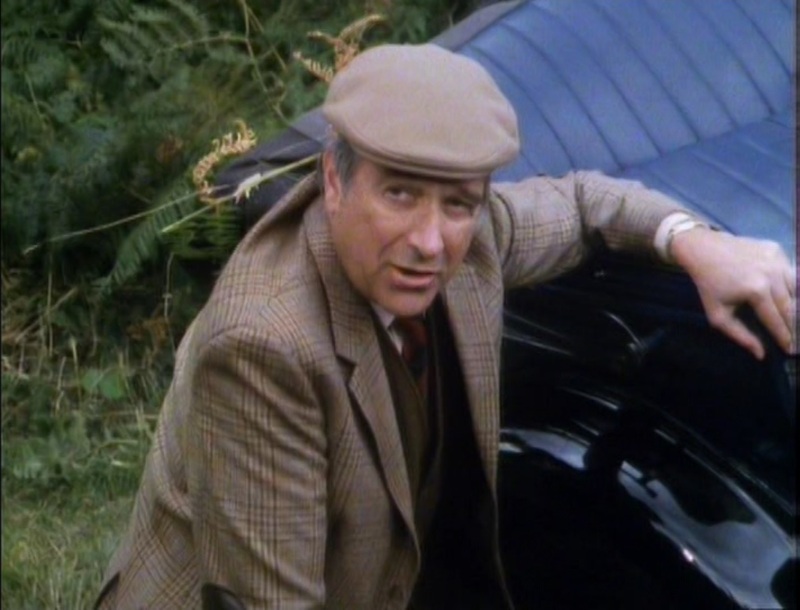 There’s never been a worse directorial decision than Peter Moffatt’s stultifying choice in reintroducing Nicholas Courtney as Brigadier Lethbridge-Stewart*. Turlough and “Hippo” do not name the owner of the car they steal. There could have been a line like “This is that retired brigadier’s car,” for starters. No, an actor with his back to the camera says “How are things on your end, Brigadier?” and we’re supposed to recognize the man who responds to that line as the same man who we know by his military uniform and mustache, and who had not appeared in the program in eight years. This is the lazy work of a show that is not trying. Everybody involved has figured they can pull it off because they wager that the only people watching will have read about it in magazines and newspapers ahead of time. They’re letting the PR department announce the character so they don’t have to bother. I made a different bet: that Marie and our son wouldn’t have a clue who this guy was, and I was right. 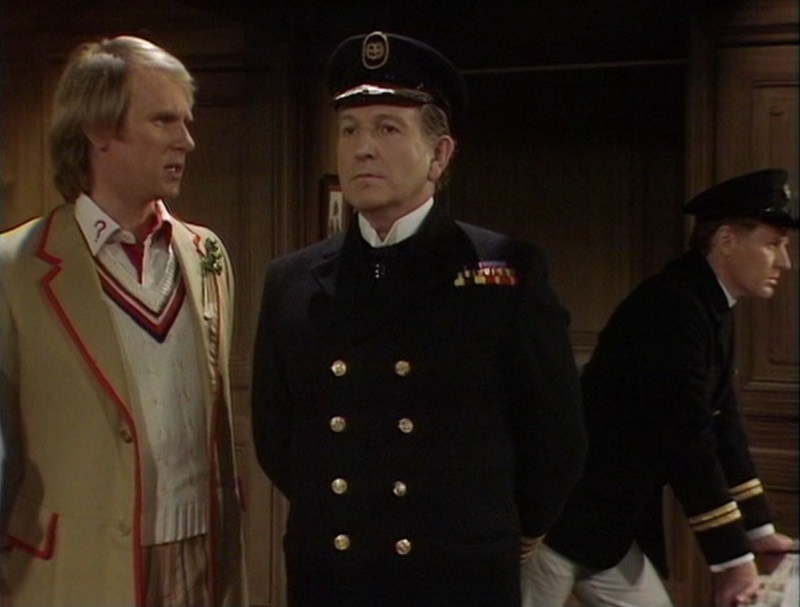 Marie noted that he was called “brigadier,” but didn’t realize it was Lethbridge-Stewart, because after twenty-five minutes, the script still hasn’t identified him as anybody we’ve ever met before. At least it gets better. The next episode is almost terrific. *Although another candidate for this honor would be Peter Moffatt again, two years after this story, reintroducing the Sontarans by way of an establishing shot from about a hundred yards away.